When Christian commentators get excited about Slavoj Zizek’s dialogue with Christianity, it seems to be sort of like the biggest high school nerd getting excited because the head cheerleader casually said hi to him in the hallway. As one of my mentors told me some time ago, for anyone to get excited about intellectual developments in Christianity in the last fifty years is a little like becoming obsessed with the politics of a kindergarten sand box. It goes without saying that we are on the defensive. It should go without saying that even the most militant Christian ideologue doesn’t believe in half the words that come out of his mouth. As Zizek would point out, most fundamentalists say and do absurd things precisely because they don’t really believe, not because they do. This from my mother, who could seamlessly weave faith and folklore, old wisdom and wives’ tales into her exhortations to close the door when I left the house or not put too much salt in my food. Even my mother has standards, even when it seems that I don’t. I had another strange eoncounter with la Santa Muerte recently. AG and I went to eat dim sum with friends this past weekend. As usual, so much social activity was too much for us, so we returned home and switched on the T.V. As usual, we had two hundred channels of nothing to watch, but out of sheer nostalgia, I paused at the Spanish-language station when I saw they were showing an India María movie. For those who are rusty in regards to their Mexican popular culture of the last four decades, la India María was a comedic character created by María Elena Velasco that embodies the Mexican equivalent of “black face”, though the veiled racisim here is a little more innocuous. María is just a poor Indian woman confused with urban life and the newfangled ways of the people she encounters in the city. But she proves to be more cunning than everyone else, and manages to save the day in spite of herself. I can’t tell you how many times as a child growing up in the 1980’s I was forced to attend movies or watch on T.V. Velasco’s slapstick antics. Well, serendipity struck twice, since the above scene was the one I encountered when I turned the channel to the Spanish station. It is a macabre scene in the 1976 film, El miedo no anda en burro (literally, “Fear does not ride a donkey”). She encounters a man playing the organ with, of all things, a picture of la Santa Muerte over the keyboard. Not much explanation is given regarding the placement of the picture. Nor does the picture seem to be more than a personification of death in the context of the movie. But the image is very much the one that is venerated by her devotees. Just another interesting piece of my armchair urban anthropology on a Saturday afternoon. Above is a video about a French man executed in Chile. Unlike some other examples of the veneration of executed figures in the Catholic world, the murderer Emile Dubois showed no signs of repentance when he was executed in early 20th century Valparaiso, Chile. Another example, a little more recent, also in Chile, was that of the “Jackal of Nahueltoro” , who was executed for the crime of killing a woman and her daughter in cold blood. Though showing real signs of reform, he was executed in accordance with the death sentence handed down to him. In the latter case, at least, people felt that the man’s crime was a product of the corrupt social order where education and opportunity for self-improvement were not offered to the man until it was too late. With Dubois, however, not only was he a cold-hearted murder, but he refused to repent at the gallows, rebuffing the priest by saying: “I will confess to God Himself, not one of His representatives”. The men in Mexico still carry lodestones to give them success and great virility. They regard the stone as a living being, every Friday placing it in water, then in the Sun, and giving it iron filings to “eat”. However, they also believe that this stone has a devil inside and will not enter a church with it. Another belief is that if a lodestone is rubbed on a knife blade, anyone wounded by that blade will die of the poison left there. Some may discount the above as coming from a disreputable source, or think that it is the result of some bizarre “New Age” thinking influencing the minds of Mexican men. The only problem with such a supposition is that the cult to the lodestone is an established “tradition” in many parts of Mexico, and I have even translated a prayer to it here. 1. I went to a rather scary botanica in east Oakland right before I left California. Saw a lot of interesting stuff, and they had dozens of statues of Santa Muerte. If that had been the first botanica I had ever visited, I would have been really creeped out by it. In the back, next to the consulting room (botanicas tend to do a lot of that kind of business), there were two twin niches: one to the Virgin of Guadalupe, another to la Santa Muerte, all decked out as if she were a Virgin. If I had a camera, and was permitted to take a picture, I would have. The contrast between the “light Mother” and “dark Mother” was Jungian theory in living, folk Catholic color. 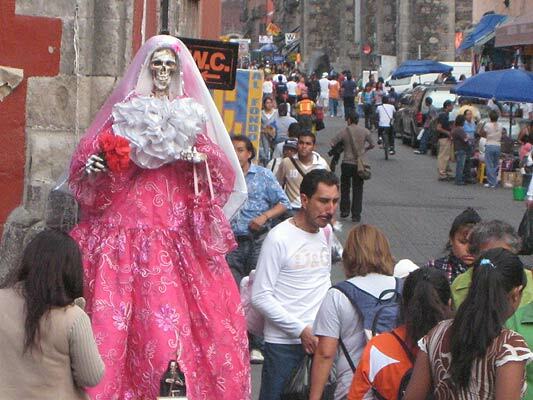 They were going to have a “fiesta de Santa Muerte”, but I could not make it, since by then I had left California. 2. Not quite a botanica, but something similar: it was at the New Orleans Spiritual Voudou Temple, which if you go in the entrance, looks like a botanica with a New Age flavor and ridiculously overpriced. Anyway, I took advantage of their offer to go into the “altar room”, though few ceremonies actually take place there. As I entered and exited, I noticed a large doll dressed in white with a mitre on its head. “Hey,” I thought to myself, “that’s John Paul II.” I was too afraid to ask my guide about the doll, but I was not surprised to see him there. So you know, at least in one place in New Orleans, a Voudou priestess invokes the spirit of the late Pontiff. JP-2, we love u! There is an actual botanica up the street a bit from downtown, but it mostly deals in candle magic and statues. 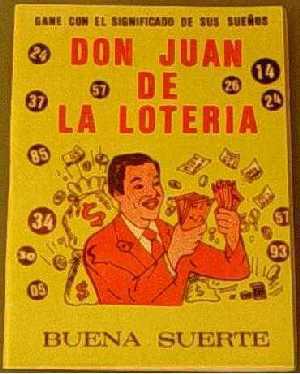 Plus, it has more of the original, Cuban santeria / palo mayombe flavor to it. It has a particularly impressive statue of St. Lazarus, or Babalu-aye. 3. AG and I went on a tour of the French Quarter that ended at St. Louis No. 1 cemetery and the tomb of Marie Laveau. There is still devotion in the city to the Voudou Queen, and various piles of Mardi Gras beads and trinkets were left at the foot of her free standing grave. But I noticed another offering on the side of the tomb that was a little odd: a copy of Ayn Rand’s novel, Atlas Shrugged. I hope her devotees will bring her better reading material in the future. which you promised to Abraham and his seed. Notice the ancient scales of Maat, signifying judgment over souls. I suppose that is why some people say that it is St. Michael that comes to retrieve souls at the point of death. A very astute man / he was the best police / and he visited the narcotraffickers just how he looked / They thought he was Malverde and offered up prayers to him. The impostor asked them: Where do you move your shipments/ to protect your merchandise/ be it through Tijuana or Nogales/ And when they told him / He sent the police after them. The dudes are astute and soon they realized what was going on / They caught that liar / at the other end of a machine gun / in the neighborhood of Las Quintas, there they evened the score. This gory ballad is an example of the now infamous narcocorrido, but with a religious twist. The narcocorrido is a Mexican song celebrating the exploits of a drug-related outlaw or kingpin, and is a genre made famous by such popular groups as Los Tigres del Norte. In this one, faith also comes into play, as a rather strange fable is weaved of the government using the superstition of the drug traffickers to catch them in the act of illegal smuggling. 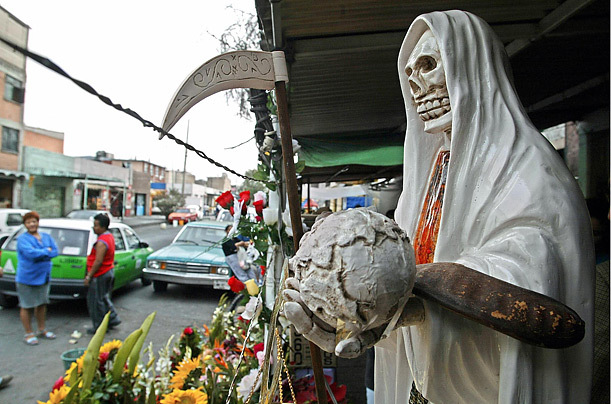 The emergence of such “narcosantos” as Jesus Malverde and Santa Muerte is not an isolated incident in the popular Mexican religious consciousness, but is rather a sign of escalating violence in Mexican society, the growing importance of the drug trade, and the general decline of the rule of law.